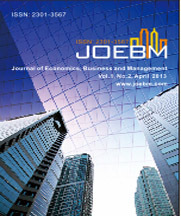 Option 1: Publication in JOEBM. Submissions will be reviewed by the conference committees and journal editorial board, and accepted papers will be published in International Journal of Economics, Business and Management (JOEBM) , which will be indexed by Electronic Journals Library, Doi System, Google Scholar, Crossref, and ProQuest, etc. Option 2: For those who're NOT looking to publish their papers, it's acceptable to submit your abstracts to the conference, which will be sent to at least two technical committees for a brief review, and it will take about 10 working days. Publication in Journal: Extra pages will be charged $50 (US dollars) per extra page. 7. Please send the required documents:1. )final paper; 2. )signed copyright form; 3. )filled registration form; 4. )payment proof to icebm@iedrc.org to finish the registration. 1. All submitted articles should report original, previously unpublished research results, experimental or theoretical. ICEBM will not accept any paper which, at the time of submission, is under review, is accepted for publication, or has already been published in another conference or a journal. Authors are also expected not to submit their papers elsewhere during the ICEBM reviewing period. 2. For Authors: you can publish the manuscript and deliver paper presentation on ICEBM 2018, orally or by poster presentation. You must submit Full-length Manuscript for review before the submission deadline. For Presenter Only: you can deliver a presentation on ICEBM 2019, but the presented manuscript WILL NOT be published. Abstract is necessary to submit. 2. Journals for participants who registered with full paper.